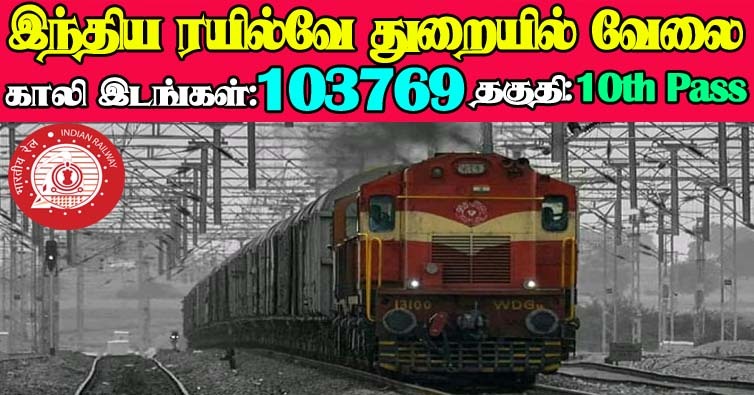 RRB Recruitment 2019 - RRB invites Online applications for recruitment of 103769 Level 1 (Group D) Posts. This online facility will be available in the Official website www.rrbchennai.gov.in from 12.03.2019 to 12.04.2019. Prospective candidates will have to apply online after carefully reading the detailed advertisement regarding the process of examination, eligibility criteria, online registration processes, application fee/ intimation charges, pattern of examination, Syllabus, How to Apply, Question Paper, issuance of admit cards/call letters, Exam Date, Result Date etc. and ensure that they fulfill the stipulated criteria and follow the prescribed processes. b. OFFLINE fee payment through i. SBI Challan Payment mode in any branch of SBI ii. 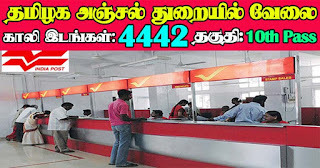 Post Office Challan Payment mode in any branch of Computerized Post Office. The offline payment will be allowed till 13:00 hrs. of 18.04.2019 and Online payment will be allowed till 23.59 hrs. of 23.04.2019, for candidates who register successfully till 23:59 hrs. of 12.04.2019. After making payment, these candidates should submit their completed applications on or before 23.59 hrs. of 26.04.2019. Eligible candidates can apply online through the Official website www.rrbchennai.gov.in from 12.03.2019 to 12.04.2019. Before applying, Candidates should ensure that they fulfill the eligibility criteria as per published in the online advertisement. 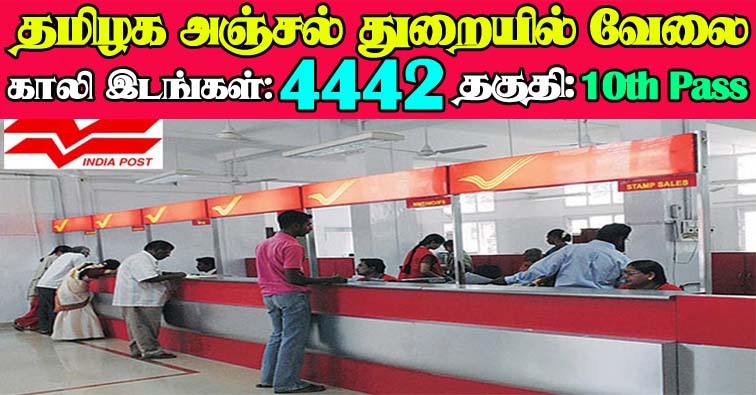 Tamilnadu Postal Circle Recruitment 2019 - Tamilnadu Postal Circle invites Online applications for recruitment of 4442 Branch Postmaster (BPM), Assistant Branch Postmaster (ABPM), Dak Sevak Posts. This online facility will be available in the Official website http://www.appost.in/gdsonline/ from 15.03.2019 to 15.04.2019. Prospective candidates will have to apply online after carefully reading the detailed advertisement regarding the process of examination, eligibility criteria, online registration processes, application fee/ intimation charges, pattern of examination, Syllabus, How to Apply, Question Paper, issuance of admit cards/call letters, Exam Date, Result Date etc. and ensure that they fulfill the stipulated criteria and follow the prescribed processes. The Job Profile of Dak Sevaks will include all functions of viz sale of stamp sand stationery, conveyance and delivery of mail and any other duties assigned by Postmaster/Sub Postmaster including IPPB work in the Departmental Post Offices/RMS. However, the work performed for IPPB will not be included in calculation of TRCA, since the same is being done on incentive basis. He may also have to assist Post Masters/Sub Postmasters in managing the smooth functioning of Departmental Post Offices and do marketing, business procurement or any other work assigned by the Post Master or IPO/ASPO/SPOs/SSPOs/SRM/SSRM etc.